Las Vegas is known for many things: gambling, showgirls, Cirque du Soleil extravaganzas, outrageous buffets, and naughty behavior, to name just a few. It is less known for its roller coasters, but there are a few, and they complement the city's "adult playground" reputation (with an emphasis on “playground”). There used to be more thrill machines along the famed Strip. The MGM Grand, for example, offered the indoor coaster, Lightning Bolt, at its MGM Grand Adventures theme park. The coaster (along with the entire park) closed in 2000, a mere seven years after it opened. You could have boarded Speed- The Ride, a launched NASCAR-themed ride that began inside the Sahara and barreled through its famed neon sign. It closed in 2011 along with the famed hotel-casino. In the 1990s, Vegas flirted with theme parks as it attempted to tweak its image and attract more of a family audience. But visitors weren't really looking for Disney World plus gambling, and the city more or less abandoned its outreach to underage guests. (Although some of the lavishly themed casino-hotels are as whimsical and immersive as any theme park.) The following coasters remain, however, from the family-friendly era. It sure looks stunning as it snakes and pirouettes through the Manhattan landmarks along the Strip in front of the casino. But The Big Apple (which used to be known as the Manhattan Express and then, simply, The Roller Coaster) is more of a stun to the system than an enjoyable coaster experience. It is among the lowest ranked coasters we ever had the displeasure to review. Not only that, it costs a small fortune to ride. This is one Vegas bet you probably wouldn't want to take. Read a (not very flattering) review of The Big Apple coaster. You can't see the Canyon Blaster blasting along the Strip, but you can see the garish pink-domed building that houses the climate-controlled Adventuredome indoor theme park at Circus Circus. Among its featured attractions are two coasters. No park fan would ever list the Canyon Blaster as a favorite ride, but it offers decent thrills, especially for an indoor attraction. Elements include a double corkscrew and two loops. You might want to secure your casino chips before you submit yourself to the coaster's inversions. 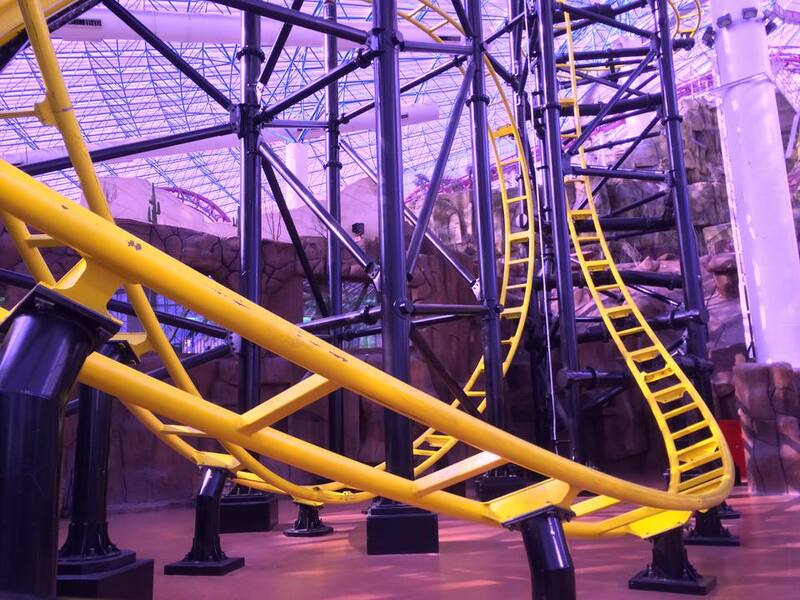 The other major coaster at The Adventuredome is El Loco. The compact ride uses single-train, four-passenger cars and features tight turns and two G-force-heavy inversions. It hits a top speed of 45 mph and is over in a little over one minute. OK, Desperado is not technically in Las Vegas. It is about an hour away at the California-Nevada state line on the highway that connects Southern California to the gambling hotspot. One of the first hypercoasters, the monstrous ride clocks in at an unnerving 80 mph and, when it is running well (which unfortunately is not all the time), its airtime can be a joy. Read our review of Desperado at Buffalo Bill's. There isn't a roller coaster on top of the 900-foot Stratosphere Tower. But there used to be one called the High Roller (you gotta love the name, right?). The Strat removed the relatively wimpy coaster (relative in that the coaster itself was quite tame, although it was on top of a 900-foot tower) in 2006 and replaced with even more insane thrill rides—one of which is the aptly named Insanity. Read an overview of the Stratosphere's thrill rides. By the way, The Linq repurposed the High Roller name for its observation wheel, which at 550 feet is the world's tallest.